The basic tools required are a 6″ eye-type lacing needle, scissors, and a pair of needle-nose pliers. 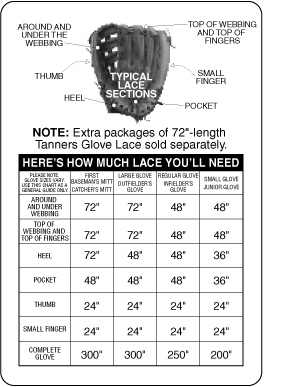 Standard 3/16″ width lace is preferred on virtually every section of every glove. The wider 1/4″ width lace is only used as needed for extra strength, perhaps on the glove’s webbing and/or top-of-fingers on some catcher’s mitts, first basement’s mitts, and larger outfielder’s gloves. Try to match the lace width of the new lace to the lace the manufacturer put in the glove. The lace color is a matter of personal choice. Using a pair of scissors, make a small point on one end of a new lace. Cut only enough so that the end of the lace fits into the hole at the end of the 6″ eye-type lacing needle. Insert the pointed end of the new lace into the open end of the needle. Push and twist the end of the lace clockwise and screw about 1″ of lace into the threaded open end of the needle or until it is secure. Tug on the lace to make sure that the needle is gripping it tightly.